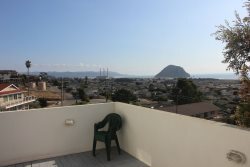 Spacious 3 Bedroom, 3 Bathroom Home, Centrally located in Morro Bay! Beautiful Ocean view home in Morro Bay! This 3 bedroom, 3 Bath home comfortably sleeps 9 guests and is a perfect destination for your next vacation. This two story home has three bedrooms downstairs along with two full bath. Spend your afternoon relaxing in the spacious front room with a large kitchen and ocean views from almost every window. Wake up to the Pacific Ocean in the mornings while enjoying your coffee on a beautiful deck. The deck offers a large table for dining along with glass wind protectors to stay warm! This home has everything you could possibly ask for in a vacation rental and is ready to accommodate you on your next trip.